The S3004-E300 is a 868 Mhz Dolphin Starter Kit including PTM 210 STM 330 ECO 200 PTM 330 USB 300 and it has been designed to demonstrate EnOcean’s energy harvesting and ultra low power radio technology. Included in the kit are a set of energy-harvesting, low-power radio and sensor modules, as well as a USB radio gateway and EnOcean’s DolphinView Basic software. Together, they enable engineers to explore applications for battery-free wireless sensors in building automation, smart home, and numerous other Internet on Things applications. The kit is ready to use after installing the DolphinView Basic PC software and plugging in the USB 300 radio gateway. The software connects to the USB 300 with a single click. Connecting to other devices is then similarly straightforward. The PTM 210 included in the kit is a complete battery-less pushbutton radio for use as a wall-mounted flat rocker switch in smart-building applications or as a handheld remote control. It is connected by pushing the rocker, which sends a wireless telegram back via the USB 300. DolphinView Basic then adds the new device to its node list, and is able to show telegram content and interpret EnOcean Equipment Profiles (EEP). Also part of the kit is the ECO 200 energy converter, which combines with the PTM 330 ultra low-power radio module to create a maintenance-free wireless switch suitable for various industrial applications. The two units snap into the sample moulded-plastic housing also included in the kit, to demonstrate how the ECO 200 converts enough energy from linear motion to transmit periodic telegrams via the PTM 330 radio. Connecting the two modules in the housing and pushing the button on the ECO 200 sets up a wireless connection to the USB 300 allowing the user start analysing the radio telegrams in DolphinView Basic. Users can also evaluate the STM 330 solar-powered temperature sensor, which can be used for a variety of temperature-monitoring applications such as heating controllers or industrial-safety systems. Thanks to its extremely low power consumption, this module can maintain uninterrupted operation transmitting a measured value every 15 minutes, requiring only 3.6 hours of charging per day (at 200 lux). With its energy-storage mechanism fully charged, the module can continue fully functional for four days in complete darkness. PC software DolphinView Basic visualizes and interprets EnOcean radio telegrams. It receives messages via USB 300, shows telegram content and interprets EnOcean Equipment Profiles. The push-button radio transmitter module PTM 200 enables implementation of wire-less remote controls without batteries. Key applications are wall-mounted flat rocker switches as well as handheld re-mote controls. ECO 200 is an energy converter for linear motion. In combination with PTM 330 ra-dio module it enables miniaturized switches for multiple application areas. 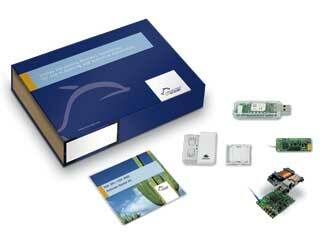 The solar powered sensor module STM 330 enables wireless temperature sensors and room operating panels. It can be ex-tended with a plug’n play humidity sen-sor. USB 300 provides a bidirectional EnOcean radio gateway via USB to the PC. Radio messages will be sent and received via PC software DolphinView Basic.